mid-century vintage pieces to enhance any home decor. When you enter you will find pieces from well-known local and European artists. It's a great place to find something special for your home and does not have to break the bank as there are one of a kind pieces starting from $20 and more unique art pieces go into the thousands for the collectors amongst us. We are located on College Avenue in the Rockridge district in Oakland, California. LeKube Studio represents a collective of European designers specializing in unique interior furnishings and one-of-a-kind home items inspired by mixing dramatic focal pieces with simple lines and bold colors, and combining vintage items with French contemporary designs. Le Kube's modern items specialize in quality European home furnishings such as tables, chairs, bookcases, and lamps, as well as decorative items, artwork, and wallpapers. We also sell French antiques and new pieces revolving around the art of the table, including silverware, serving platters, candlesticks and fine porcelain from France. Le Kube is a unique showcase of French design, not only a great resource for Bay Area designers, but also a cutting edge art gallery. 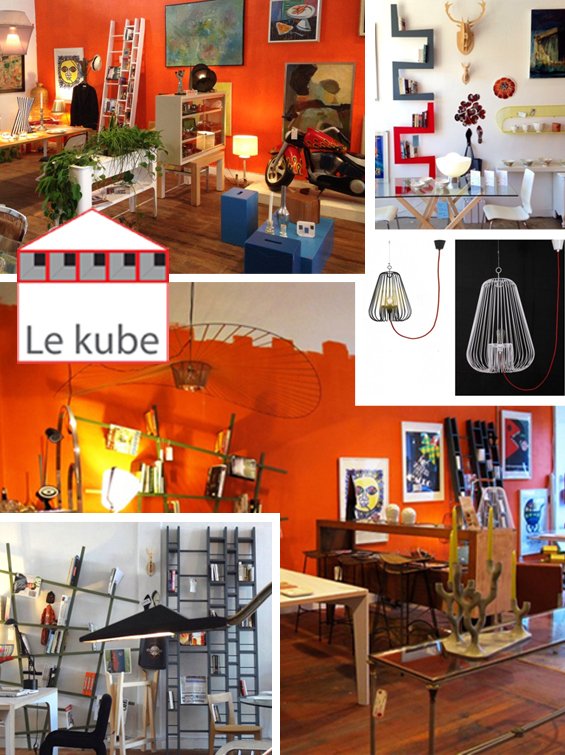 In Le Kube's vintage collection you will find a variety of local art pieces as well as European. The collection includes paintings, sculptures, original posters, and home décor items with a fun mix of pop art and classic designs. We have something to fit anyone's style, including that friend on your gift list that has everything! Are you looking to redecorate your business or home, and / or want to find that magic piece for your home or office? The owner, Romain Saide, is a designer and can help with your project, large or small. Additonally, this beautiful design store doubles as an event rental space for dinners, meetings, presentations and seminars. There is a full service kitchen in the building which is available for rental as well to prepare food for your event. Contact us for more information. Please visit Le Kube in person to see our full selection of items. We offer wholesale pricing to designers.